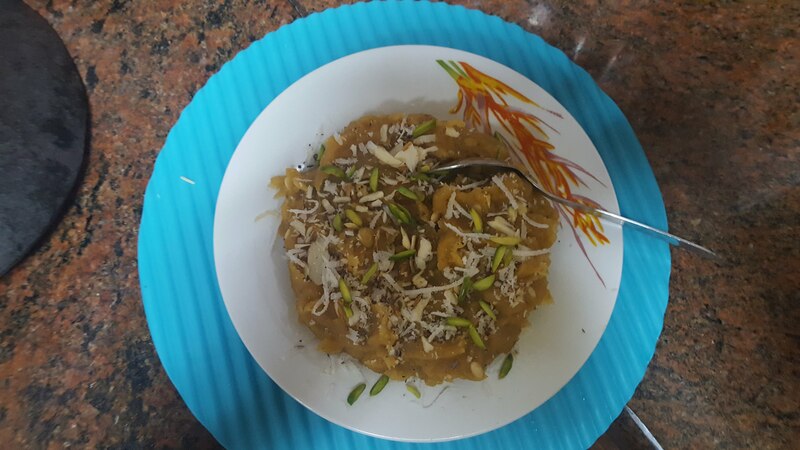 Besan ka halwa is very easy and quick to prepare this can be served any time.My father liked too much this when he had a cold and cough every time said my mother makes it for me besan halwa and really his cold will go.Because besan ka halwa is an effective nuskhe(home remedies)for curing a cold and cough.Besan is a powerhouse of antioxidants that help clear your nasal tract. Heat ghee in a heavy bottomed nonstick pan, add cardamom powder, black peppercorns powder, and besan roast it until it turns golden brown in color and aromatic. Keep medium flame.Stir continuously if not it can burn. Add sugar and slowly milk and whisk well to avoid the formation of lumps, stir and cook it on low flame. Now add half chopped dry fruits and coconut, add 1-2tsp ghee mix it well. Turn off the flame. Take it out in a plate garnish with dry fruits and coconut.